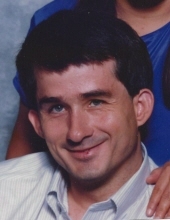 Jeffrey Lee Jamieson, 57, of Stillwater died after a long illness on Monday, April 8, 2019 at his home. At his request his remains were cremated. He was born August 23, 1961 in Blackwell, Oklahoma. He grew up in Blackwell and attended Blackwell public schools. He graduated from Blackwell High School in 1980. After high school he moved to Stillwater to attend Oklahoma State University. He graduated from OSU in 1988 with a B.S. degree in business administration and a minor in finance. On March 30, 1992 he married Mandy Chung in Martinez, California. They made their home in Stillwater. He worked for Oklahoma State University for several years. He enjoyed spending time with his wife, watching OSU sports with her, pets, fishing and following the financial markets. He is preceded in death by his mother, Alcina, paternal and maternal grandparents. He is survived by his loving wife of the home Mandy. To send flowers or a remembrance gift to the family of Jeffrey Lee Jamieson, please visit our Tribute Store. "Email Address" would like to share the life celebration of Jeffrey Lee Jamieson. Click on the "link" to go to share a favorite memory or leave a condolence message for the family.